Finally, Luke Steingruby’s Rocky is practically flawless, with an angelic voice, Charles Atlas muscles, blond hair, and a tan. 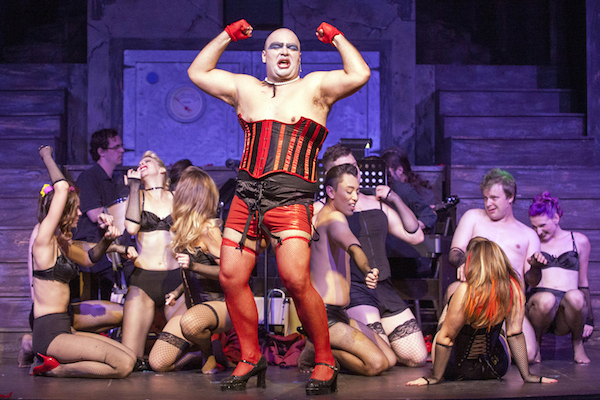 Stray Dog Theatre sashays into its sixteenth season with a bawdy, over-the-top (in the best way) production of The Rocky Horror Show. The show is pure fun, a counter-culture and audience-participation approved celebration of B-movies and flashy songs. The musical, delivered with a nod and a wink to a knowing audience, celebrates sexual liberation with hyper-charged 1970’s style and diva-esque attitude. What makes this particular production stand out is quality vocals and an attention to detail at every turn. Kevin O’Brien and Heather Matthews are simply peachy as the young lovers, but they’re completely overshadowed, in a good way, by their host and his entourage. Nothing in their conservative upbringing has prepared them for the sensually eccentric Dr. Frank ‘N’ Furter, a vivacious and teasing Michael Juncal, and his band of merry phantoms and devotees. A self-proclaimed “sweet transvestite from transsexual Transylvania,” he’s accompanied by Corey Fraine’s sinister, sneering Riff-Raff, Maria Bartolotta’s crazed, lustful Magenta, Sara Rae Womack’s wide-eyed and star-struck Columbia, and an entourage of Phantoms. Over the night, the good doctor gives Brad and Janet a liberal dose of the excitement they’ve been missing. The dichotomy creates a saucy conflict that only science fiction and a drag floorshow can resolve. The focus is on the fun in this rendition of The Rocky Horror Show, there’s more than a touch of camp in the tone and gestures, but the quality of the singing takes the production up a notch. Visually, it took me about three seconds to adjust to Juncal’s bald Frank ‘N’ Furter, but vocally he is near perfection, with growls, purrs, and just the right amount of contemporary sass to own the character. O’Brien and Matthews harmonize well, and each has a strong voice with a warm tone. Fraine hisses and snarls in key, while Bartolotta and Womack once again show great range and control, and Womack turns in a nice bit of tap as well. Michael A. Wells pulls double duty as Dr. Scott and Eddie, a full-throated rock ‘n’ roll rebel. Gerry Love is a humorous narrator with a penchant for evidence, and the ensemble is rounded out with leading quality vocalists and performers including Angela Bubash, Sarah Polizzi, and Tim Kaniecki, who really needs a role where he can show off his considerable dancing chops. Finally, Luke Steingruby’s Rocky is practically flawless, with an angelic voice, Charles Atlas muscles, blond hair, and a tan. The production is enhanced by the company’s continued commitment to make the most of their space, equipment, and budget. The fantastic, multi-story set by Rob Lippert has multiple, intricately detailed levels that help with the storytelling. Clever choreography by Zachary Stefaniak Shaffner references the original and takes full advantage of the venue while adding a few fresh twists. Tyler Duenow’s lighting recreates numerous effects and adds dramatic tone, which is amplified by Chris Peterson’s musical direction. Eileen Engel’s costumes are creatively true to the original vision and wonderfully flexible, with one glaring exception. Magenta’s primary costume is unfortunately frumpy and out-of-character, even with the lovely décolletage accent. Bartolotta is exceptionally talented and she makes strong choices as an actor, the costume stands out as incongruous with the role. The company gets so much, so much more than right, however, and there’s a palpable joie de vie in the enthusiastic cast that instantly captures and draws the audience into the fun. Plus, singing along and shouting out familiar retorts is encouraged. The impact of the choices is surprisingly fresh and satisfying, particularly for a show whose characters are so specifically ingrained in pop culture. Intentionally immersive from the moment the Usherette greets you in the lobby to the sing-and-dance along curtain call, The Rocky Horror Show, in performance at Stray Dog Theatre through October 29, 2016, is a sweet little treat you’ll be happy to indulge. If you want to join in on the fun you’ll need to get your tickets asap, as many performances are already sold out.